Dale Hawkins is shown in a 1950s promotional photo from Puckett Studios. (CNN) -- They were always traveling somewhere. At least that's what we wanted to believe. That was the magic inherent in the lives of the singers whose voices came out of our radios in those Elvis Presley/Chuck Berry/Buddy Holly years. They were everywhere, all at once, while we were stuck in one place. So when the local newspaper announced that Dale Hawkins would be passing through town, for one afternoon only, and would make a brief stop at the local department store. . . .
Well, what 11-year-old could allow himself to miss such a moment? I'm thinking about that afternoon because Hawkins died this month; the obituaries said that he was 73, that it was cancer that did him in, and that he was living in Little Rock, Arkansas, at the end. 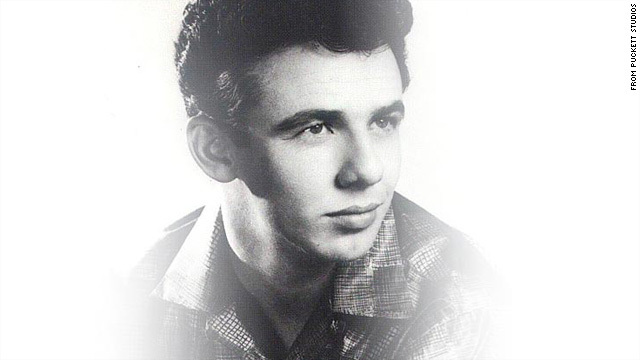 He was one of America's first rockabilly stars; "Susie Q," in 1957, was his big hit. But it was in the fall of 1958 that he moved quickly through our town for a few hours. He wasn't there for a full-scale concert; he and a rhythm-and-blues singer named Tommy Edwards, who had a smash hit with a song called "It's All in the Game" that autumn, were coming to the F&R Lazarus department store at the corner of Town and High Streets in Columbus, Ohio, to autograph copies of their 45 rpm releases. For Hawkins, the current record was "La-Do-Dada." I rode the bus downtown with a friend name Kenny Stone, who also was 11; we got there early. The setting was about as unprepossessing as any musical star could ever encounter: a little raised platform to stand on, a record player with its electrical cord snaking to a wall socket, and a half-full room of fans sort of standing around, not knowing what to expect. Dale Hawkins and Tommy Edwards may not have been the most famous singers in the United States that year, but to us they were men who lived inside our radios, which made them mystical. Yet when they walked into the room where the platform and the record player had been set up, and when they looked around to see us staring back at them, it seemed that they might feel as slightly awkward as we did. The lights were all the way up, older shoppers were noisily milling through the crowded aisles of the department store right outside the doors of the room; two singing stars on a Midwestern afternoon looked at several dozen central Ohioans they had never met, and we all waited for whatever was supposed to happen next. What happened next was that an employee of the store thanked everyone for coming -- thanked Dale Hawkins, thanked Tommy Edwards, thanked us anonymous nobodies -- and announced that each man would sing a song and then sign their records after we had purchased them. Edwards had the big current hit, so Hawkins went first. He was 22, already a veteran of the Korean War (the obituaries this month said that he had lied about his age so he could join the Navy). He was sort of rangy and raw, twangy and tough; it's hard to guess what he must have been thinking, at 22, about being sent around the country to make sing-and-run appearances like this. He put a copy of "La-Do-Dada" on the record player, turned it on, and placed the needle in the grooves. "You are the one that drives me crazy, you never say yes or no but only maybe. . . . "
"Many a tear has to fall. . . ."
If, before that day, we had thought that the lives of the stars were nonstop glamour, I don't think anything we saw that afternoon changed our minds. To us, the idea that there were men who got to make records for a living, who got to go to stores and sign autographs, who got to be in one town one day and another the next. . .to us that sounded about as good as it got. Matter of fact, it still does. Dale Hawkins and Tommy Edwards left the department store right after they signed their records for us, and we left, too, riding the bus back home after a quick stop at the Planters Peanuts store, where we discussed the wonder of what we had just witnessed. It was either that weekend or the weekend after that my family was watching "The Ed Sullivan Show," and there on the stage was Tommy Edwards. Just like in the department store, but this time he was smiling at the whole country. I don't know where Dale Hawkins was that Sunday night; maybe he, too, was somewhere watching Tommy Edwards with Ed Sullivan. The obituaries this month said that Hawkins was born on his grandfather's cotton farm in Gold Mine, Louisiana, in 1936, and set out from there. The music can take a person a lot of places, if he's good enough and he wants badly enough to make the journey. Hawkins undoubtedly forgot that Ohio department store within a few days, if not a few minutes, of when he passed quickly through it on his way to the next town. They were always traveling somewhere, the singers were. What lucky lives.